A council is to apologise to the family of a disabled boy after a 15-month delay in providing adequate education. Surrey County Council left the boy in a school that was unable to provide the correct support, the Local Government and Social Care Ombudsman said. It was also criticised for "misinformation and poor communication" after trying to block his father's attempts to pursue updates. The council said: "This young boy is now receiving the right support." The child is now in a school that can provide for his needs and the council has been ordered to pay the family £3,750. In November, the council apologised to the family of another disabled boy who missed out on half a year's schooling. Michael King, local government and social care ombudsman, said: "This case was beset with misinformation and poor communication from the council with the family. "This is unfortunately the second time we have upheld a complaint from this family about the council's poor communication." The council took too long to issue an education, health and care plan for the boy, delaying his father's attempts to challenge his school placement, the ombudsman's investigation found. This "prevented [the boy] from receiving the correct provision for 15 months longer than necessary" and caused his father "avoidable frustration," the ombudsman said. Ofsted has previously criticised the council's "inadequate" children's services. 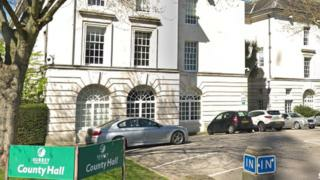 Councillor Julie Iles said the council would "act on the recommendations made, including providing extra staff training". "We've already made changes to services since this happened and we're carrying out a wider transformation which is aimed at giving children and young people the support they need at the earliest opportunity, in line with our vision for Surrey that no-one is left behind."